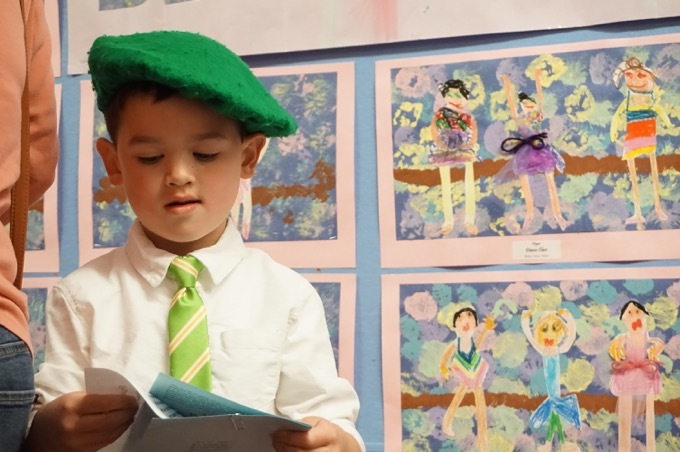 Yet again, I’m forced to remind anyone reading this that there are plenty of things to do in Connecticut, year-round – and with kids. When people think of Litchfield, they almost universally think of the town green, the beautiful church there, the top-quality restaurants, Kevin Bacon and colonial history. But there are enough cool places in Litchfield to spend an entire weekend with your family – or alone as the case may be. Heck, make that two weekends, for you could spend an entire day at the White Memorial Conservation Center. 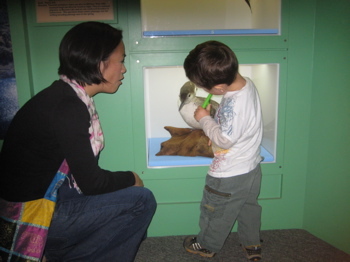 The fairly large and excellent natural history museum is but a small part of the property. 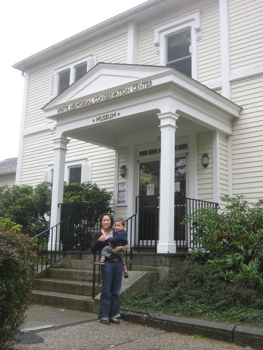 A property, like so many others in Litchfield County, which was preserved and donated by Alain C. White and his sister May. If you enjoy a state park or land trust or otherwise protected property in the northwest quarter of the state, chances are you have the Whites to thank. 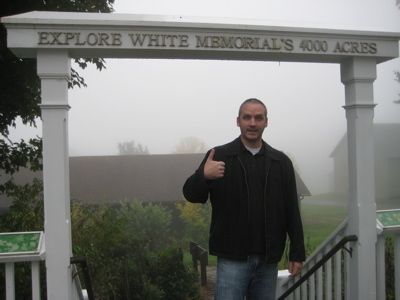 And even though I’ve written and visited plenty of places I am thankful to the Whites for, I figure this is as good a page as any to give their story some of the attention it deserves. He created many chess problems and he fixed many chess strategies too. He was considered an expert and he published many of his strategies. Lest you think that not so impressive: During World War I, Alain White broke the German Navy code in which chess problems were used. Oh, and in his spare time he played an important part in saving the Wood Duck from extinction. And wrote the history of Litchfield, a publication which is still relevant today. Mr. Donald Matthews, former Director of the CT State Parks said, “No individual or organization has ever contributed as much to the cause of conservation in Connecticut.” I’m telling you, if you ever go anywhere in or around Litchfield, research the history of the land and chances are the Whites gave it to the state. Campbell Falls State Park in Norfolk (CTMQ Visit), Sunny Brook State Park (CTMQ Visit here)… on and on. Exquisite dioramas and spectacular artwork help tell the story of this unique 4,000 acre wildlife refuge – its history and many diverse habitats. 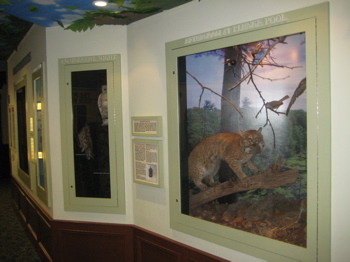 Wetlands, fields, old growth forest and upland hardwood forest are depicted with giant photo murals and animal mounts. 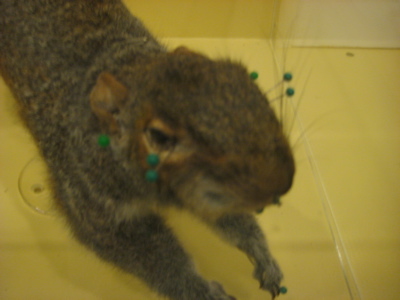 A special exhibit on the Art of Taxidermy explains how the mounts were made. 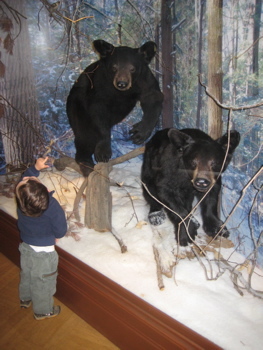 A children’s room with books and activities, live snake habitat, beaver dam, fluorescent rock cave, bird sculpture garden, and much more offers a fun and informative experience for the whole family. 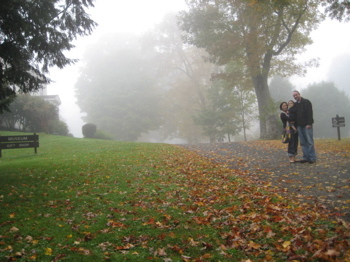 Hoang, Damian I made made the drive on one of those murky, clammy October days that – for me anyway – hold a sort of romance. 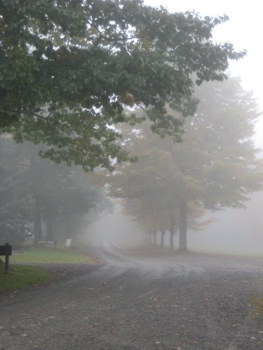 Childhood soccer games, Boy Scout camping trips, football… all those things swirl around in the autumn fog for me. I love them. And what better way to get started than with some Bantam Bread Company dirt bombs? 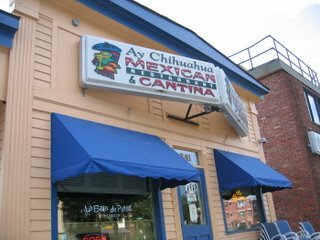 Yes, one of the best baked treats in the state can be had just past the entrance to the conservation center on route 202. 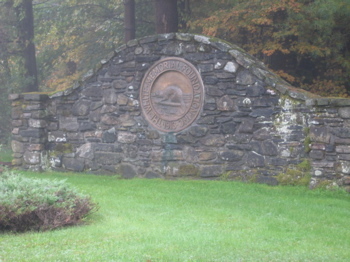 (CTMQ’s visit here.) Sufficiently ecstatic, we parked and entered the museum. The White Memorial spends a lot of effort telling the story of the geology of the area. I applaud this effort as I happen to think geology is one of those subjects “the kids” just aren’t learning about anymore – and really should be. 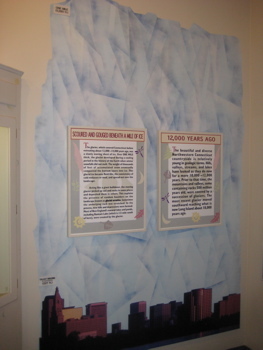 There’s a cool display showing modern Hartford, Connecticut underneath the mile-thick glacier than covered the area 12-14,000 years ago. There’s the Traveler’s Building, dwarfed by the glacier that scoured out the aforementioned Bantam Lake. It’s appalling that many kids would think this scenario pure fiction. 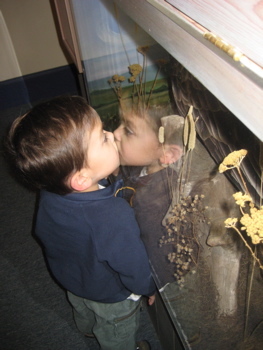 Don’t ask me why, but Damian felt compelled to kiss the glass holding a stuffed raptor of some sort. Then, as is her way, Hoang followed suit. Meanwhile, while those two clowns were goofing around, I chose to actually learn something. 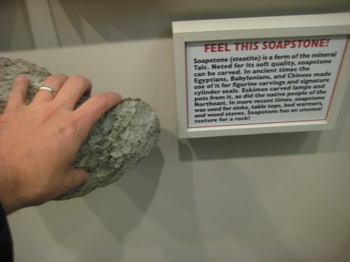 The museum has a nice sample of soapstone, available for touching. Now, I’ve hiked through a bunch of former soapstone quarries in Connecticut and beyond, but had never laid my hands on it before. It’s a really unique rock to say the least; it almost feels pliable as you rub it. It does leave a sort of greasy film too, but that may just have been the grime of 400 museum visitors before me, I couldn’t tell. From the geology the exhibits move towards the white man’s arrival. There’s a rather amazing display of the original deed to purchase Litchfield from the Potatucks for the whopping total of fifteen pounds. The best part is the list of Potatuck names on the deed: Chusqunnoag, Quiump, Magnash, Kehow, Sepunkum, Corkscrew, Poni, Wonposet, Suckqunnokqueen, Toweecume, Mansumpansh, and we can’t forget Norkgnotonckquy. Great names… but how the heck did Corkscrew squeak in there? Are we sure he wasn’t some 1956 greaser who, hepped up on goofballs, didn’t deface the document with his own gang given nickname? “Oh hey Suckqunnokqueen, how’re the kids? Good? Me, Quiump and Corkscrew are gonna go hunt some deer, you in?” Nah, there’s no way. And come to think of it… Poni? As in Poniboy? Where’s Sodapop? 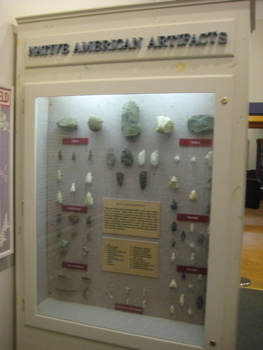 There are the usual native American artifact displays, including a rather impressive arrowhead and implement exhibit. This museum does a really good job of explaining everything you’re looking at; not too wordy but not too dumbed down either. They also employ a really cool panoramic photo technique. 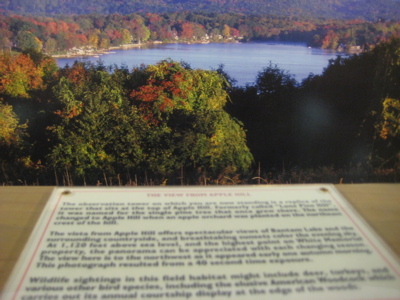 In one large display, there’s a nice shot of Bantam Lake in the fall from an “observation deck from Apple Hill” built in the museum. So you walk up some wooden stairs and are transported, in a way, to a hilltop observation deck in the woods. I love that idea and am surprised it’s not used more often around the state. I must admit that I sort of skipped over a lot of the 19th century history displays. You shouldn’t, for they are interesting and rather complete, but as you can guess I’ve seen them all before. 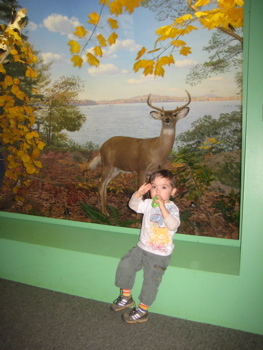 Besides, Damian was far more interested in the nature portion of the museum, so that’s where we spent most of our time. Tricked you! This is another giant photo on a wall and it’s just as cool as the last one. Especially since there’s an otter to the right and a red winged blackbird to the left – two of my all-time favorite Connecticut animals. 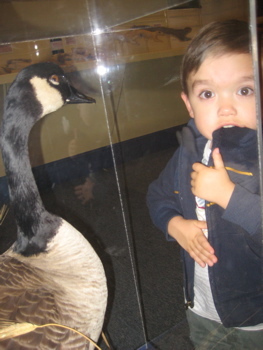 From there, we were treated to a bunch more animals behind glass. If you enjoy all these ducks and other waterfowl, you should also check out the Livingston Ripley Waterfowl Conservancy just a few miles away (CTMQ Visit here.) All the birds there are alive. 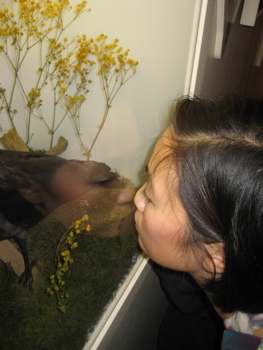 The displays here all seemed to involve the predator/prey relationship. As you probably have guessed, I enjoy that. A bobcat eating a bobwhite. A fox on phlox eating lox. (Okay, a flying squirrel but whatever.) 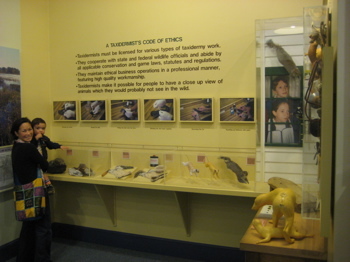 While Damian was cooing about the animals and then adjourning into the fun room set up specifically for little kids, I read some stuff about Catlin Woods. Catlin Woods consists of about 30 acres containing several dozen big white pine and hemlock along with mature hardwoods such as oak, birch and maple. The oldest trees are estimated to be over 200 years old. It’s one of the last remaining (relatively) old grown tracts in the state. I also checked out another unique display: ceiling silhouettes of nocturnal flying animals. Most birds were more dusk fliers, and flying squirrels don’t really fly but glide. But the best of all was the nighthawk. They are not hawks and they hunt during the day. The silhouettes were overlain constellations. Sort of a two-for-one display. We continued through the one floor museum and found a whole lot more on birds. A massive picture/sound display allows visitors to listen to the various birdsongs. “Flying” stuffed birds hang all over the place and the large picture window gazes across the fields of birdhouses and feeders. Along the walls are more earthy displays about trees and roots and soil and all the creatures that live within them. 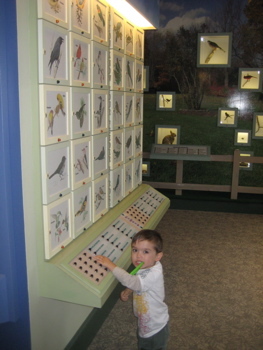 I was really enjoying the honey bee display, but Damian had moved along to the backyard animals section. 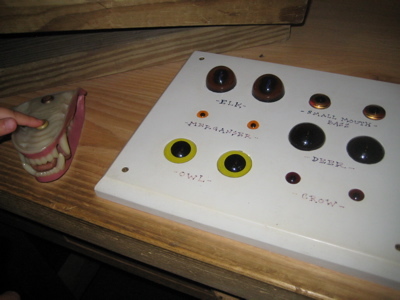 Here, a model house’s deck led down to a yard with information about all the critters we’re apt to see there. Anyway, I recall thinking we were done with the museum but then turned another corner and found another large room with a giant beaver lodge. You never really appreciate how big these things are until you see something like this… They are huge. Beavers really are among the most amazing mammals on earth. On the other side of the lodge, the structure cleverly transformed into a rock outcrop showing the rock strata of our region – complete with a baying coyote on top. 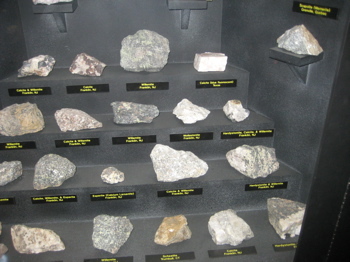 Inside, we found a bunch of mineral samples from the northeast. And with that, we came full circle inside the museum. We started out with how our geology came to be and ended with a good exhibit about our present day geology. Well done, White Memorial, well done. 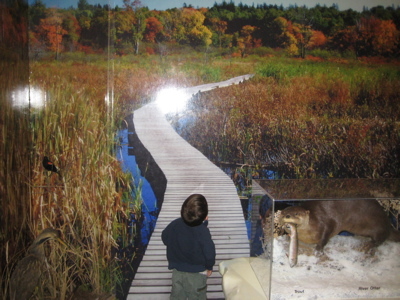 One thing definitely worth a visit is the actual marsh boardwalk at White Memorial. It must be close to a mile in length and gives you a close-up view of otherwise hard-to-see plant and animal life. 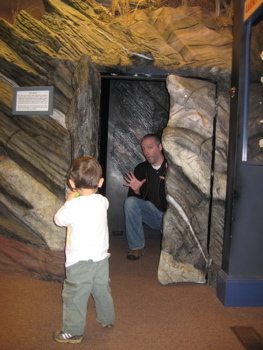 Because it’s like it appears in the wall picture, narrow and without handrails, it can be a bit risky with small children, you have to hold their hands at all times. Hm. I had no idea VDARE had a PO Box (and therefore perhaps an HQ) in Litchfield. 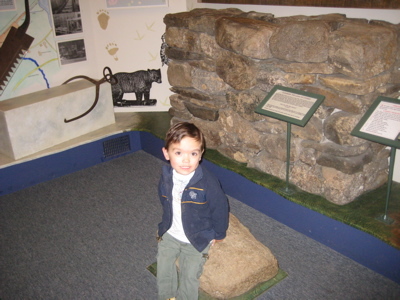 I’m fairly certain they wouldn’t approve of my “cute kid” though, being a “half-breed” and all. Peter Brimelow, the head of VDARE, lives in or near Litchfield, hence the PO box address. I don’t believe there are any actual offices. Wow. What a fascinating guy! Born in England, marries a Canadian, moves to the US and writes a bunch of books about how bad immigration is for the US? Then he (in his 60’s) marries a 22 year old Heritage Foundation intern? And VDARE is “rated a white nationalist hate group” by the SPLC? At least he’s doing his part to keeping Litchfield lily white.